Very specifically, I looked at these artists with a view to examining how they made marks. 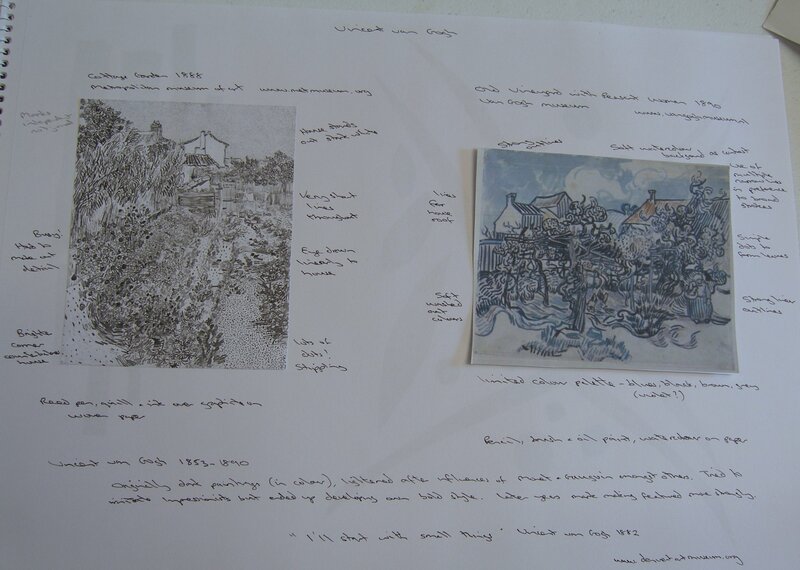 Although I have visited different exhibitions – and have visited the van Gogh museum in Amsterdam – I have not looked at the work of an artist in detail so this activity is a new one for me that will need developing as I learn the skills of analysis needed. To start, I simplified the task by picking two works from each artist that I thought showed interesting marks. I referred to the OCA Study Guide on Looking at Artists and Photographers. This guide suggested sticking a picture in the top part of the page and making notes around it as to the colour, composition etc. The bottom section of the page is for general information relating to the artist that cannot be garnered from the picture itself. I have not reviewed the broader work of the artists, only the mark making specific to the artworks chosen. 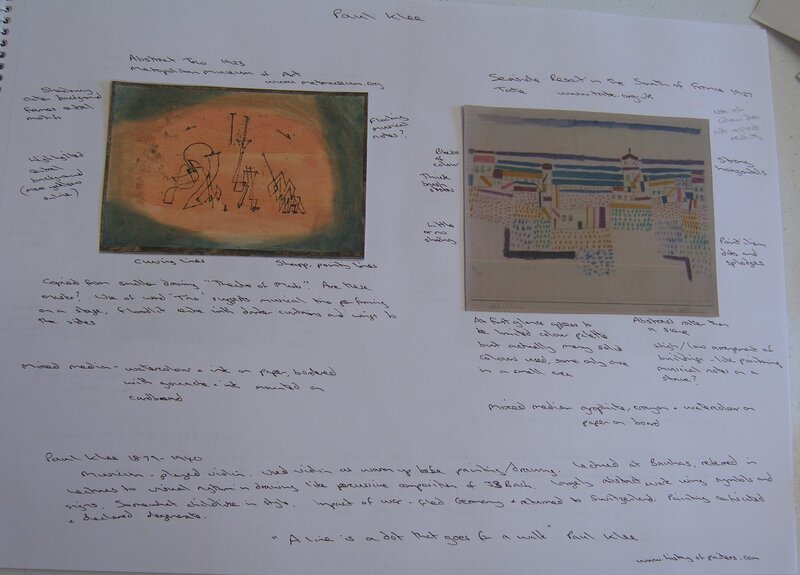 I chose Abstract Trio and Seaside resort in the South of France to show very contrasting styles from Paul Klee. Klee, 1879-1940, worked in a very abstract way. He was a keen violinist and often used played the violin as a warm up prior to painting. Klee regularly referred to drawing as being similar to a musical composition in his lectures at the Bauhas. – different mixed media used in each. Here I looked at Cottage Garden and Old Vineyard with Peasant Woman. Van Gogh, 1853-1890 started painting in a very different style producing realistic works with a dark colour palette (like the Potato Eaters). It took many years before he found his own way of mark making that we now recognise as being very distinctly van Gogh. – limited colour palette used. What this review has shown me is that there quite simply are no hard and fast rules for creating drawings and art. They can be simple or detailed, in colour or black and white, short marks or long marks, realistic or abstract and in any media. It is up to the artist to develop their own style. But also, one shouldn’t confine onself to a specific style all the time – a style can develop and change over time into something quite different.